Well, let’s just give Muslims special time off EVERY FRIDAY because someone has decided that it’s mandatory for students to attend prayers. 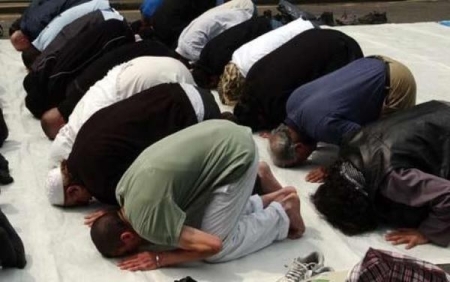 A non-profit Islamic group in Florida is requesting that Muslim students be released early from public schools “every Friday” so children can attend mandatory prayer services, for under Islamic law, it is “sin” to miss the obligatory prayer sermon. There are millions of Muslims in the United States and hundreds of millions across the world that don’t take a two and a half hour break every Friday for prayer services; so this isn’t “mandatory” any more than burkas or not owning dogs is “mandatory” for Muslims. The problem isn’t so much that some Muslims make these ridiculous requests because there are idiots in every religion; it’s that politically correct liberals are so willing to bend over backwards to be accommodating. When common sense tells you to laugh and say, “That’s dumb,” there’s always some liberal who’s dying to roll over. That’s why it’ll be fascinating to see how the public schools in Tampa respond to this demand.